The East Ayrshire monument to the Abkhaz-Georgia war has been temporarily removed. A Scottish war memorial is at the centre of a bitter row between the Georgian government and a separatist region backed by Russia. The monument to Abkhazians killed in the region's year-long war for independence was erected in Kilmarnock in the 1990s. 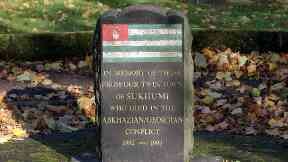 The East Ayrshire town was then twinned with Sukhumi, an Abkhaz city at the centre of the conflict. However, following discussions between the Georgian ambassador and a Scottish minister the memorial has been temporarily removed. The decision was condemned by the de facto Abkhaz government, a vocal supporter of Scottish and Catalan independence. "This behaviour of the official authorities of Georgia is regarded as an act of vandalism aimed at destroying the historical memory of the Abkhaz people against whom Georgia committed ethnic cleansing and genocide," the Abkhaz foreign ministry said. Georgian ambassador Tamar Beruchashvili, who described the removal of the memorial as a "good result", first wrote to the UK Government in September. She claimed its wording and the inclusion of the Abkhaz flag is contrary to the official stance of the UK, which supports Georgian sovereignty and does not recognise the region's independence. The ambassador later discussed the issue with international development minister Alastair Allan during a visit to Scotland. She claims the memorial is part of a campaign by Abkhaz ally Russia to "propagate the so-called independence of Abkhazia and South Ossetia". However, the decision to remove the memorial was ultimately made by East Ayrshire Council, the Scottish Government said. 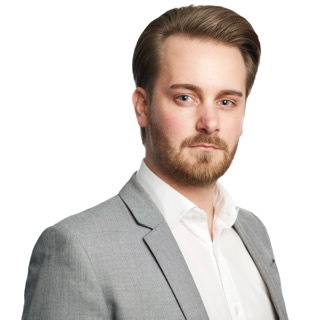 "We have fully cooperated with the Foreign Office in their attempts to address Georgian and Abkhaz officials concerns over this matter," a spokesman added. The monument will be reworded in a "more appropriate manner" before it is restored, East Ayrshire Council said. It said the new memorial will "remember those from Sukhumi who fell on both sides of the conflict". 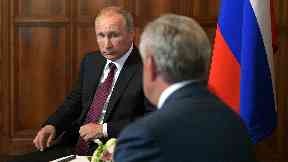 Special relationship: Russian President Vladimir Putin meets Abkhaz counterpart Raul Khajimba. Kilmarnock is no longer twinned with Sukhumi but remains in what the local authority described as a "friendship relationship". The Abkhaz-Georgia war left thousands dead on both sides and involved a large-scale campaign of ethnic cleansing against the ethnic Georgian population of Abkhazia. The region unilaterally declared independence in 1999 but it has only been recognised by a handful of states including Russia, which deployed troops there during its war with Georgia in 2008. Georgia declared its own independence from the Soviet Union following its collapse in 1991 but remains close to Russia. Former Russian president Dmitry Medvedev met Abkhazian troops during a visit in 2010 and Vladimir Putin held talks with president Raul Khajimba in August. During the meeting he spoke of Russia's "special relationship" with the region and said his country would "guarantee its security and independence". 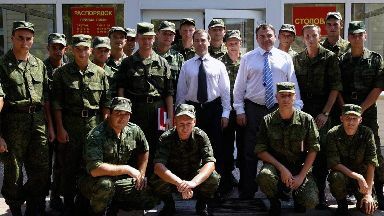 Dmitry Medvedev: Former Russian president meets Abkhaz troops in 2010.